Experiencing the thrill of making your way through natural and man made rapids in a raft is exhilirating. 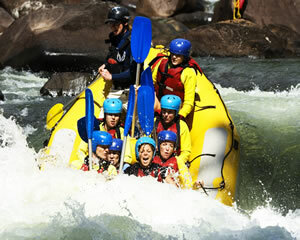 White water rafting is an exciting sport that everyone can particpate in. Enjoy the great outdoors with friends and families and jump into your white water raft to take on the rapids. 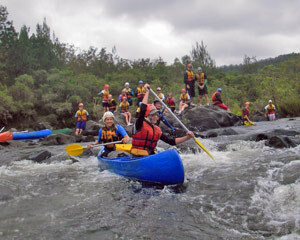 White water rafting is fun, safe and a great social activity. Go on, take the plunge and experience the thrill of white water rafting today! 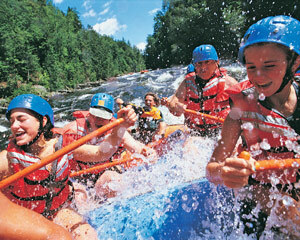 Feel the rush of white water rafting! Join us for some true fun and excitement on the Barron River. We are a vibrant, innovative and highly professional company utilising the latest in white water technology to ensure you an exhilarating yet safe half day trip. Are you ready for some white water rafting adventure along the Barron River in North Queensland? Feel the rush as you navigate your way through Grade 4 rapids and the awesome wilderness of Australia's tropical rainforests. The Barron River is North Queensland's most exciting half day tour. Feel the rush of white water rafting within the awesome wilderness of Australia's tropical rainforests. Treat yourself and your partner to two night's luxury accommodation and discover the Mornington Peninsula in style! Just 60 minutes from the centre of Melbourne, you can escape the demands of the city and explore the beauty of this area that's right on your doorstep. A charming short break. Stay overnight for Ballarat's ultimate Gold Rush Experience! Take in a fully-hosted historic banquet, behind the scenes tours, a spectacular retelling of the Eureka stockade and so much more! With a lovely room and all meals included, this stay is the best of Ballarat, all in one experience! Who in Sydney could possibly make the jewellery you really want? Oh wait, you can do it yourself! This amazing experience in a historic part of Sydney lets you spend 4-5 hours with a professional, designing and crafting the perfect piece from 15g of white or yellow gold. Explore the unique environment of the Solitary Island Marine Park by sea kayak & enjoy the 'thrills and spills' of surfrafting. Design your dream platinum wedding rings for life! This experience bonds you and your loved one, involving you both in the extraordinary business of making fine jewellery. With a glass of bubbly and $400 in extras such as diamonds, you'll spend half a day creating your rings in perfect platinum. NEW !! Over two days, experience Cairns' most popular activities - cruising the Great Barrier Reef and white water rafting through the pristine Daintree rainforest. This package will see you snorkelling the multi-coloured coral of the reef one day, and navigating the Barron River rapids the next! Just an hour south of Cairns, we have created a rafting adventurers dream on the Russell River. There is nothing else like this in Australia. 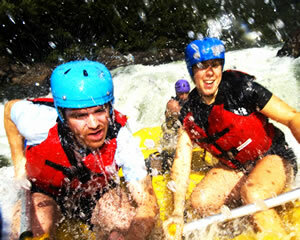 Our rafting day is affordable, nail biting and exhilarating! With rapids ranging from grade 1 to 4, there is something for everyone on this river. Just an hour south of Cairns, we have created a rafting adventurers dream on the Russell River. Along the way, you will learn about the rainforest, see crystal clear rivers, marvel at breathtaking scenery and of course experience the exciting rapids of the wild Russell River. Learn how to write songs using all the tips and tricks the hit songwriters use! This course will teach you the fundamental elements of songwriting, and become familiar with the process of writing and crafting a song. Feel the river closer than ever before, as your group is challenged to a white water rafting adventure. The two-man sports raft will demand all your concentration while you navigate downstream through the rapids and currents. Tackle the river as a group or you might find yourself getting very wet! Join us for breathtaking sports white water rafting on the Mitta Mitta River. Experience exquisite wilderness, thrilling whitewater incredible scenery and guaranteed water flows. This unique adventure activity has been developed on the beaches of Coffs Harbour. 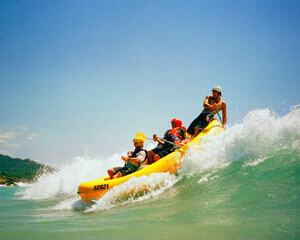 Surf rafting has you surfing the waves in 12 self-bailing whitewater rafts with plenty of thrills and spills. This unique Australian adventure activity has you surfing the waves in 12' rafts with plenty of 'thrills and spills'. Paddle out through the surf onto the cresting waves for a ride of a lifetime back to the beach - most times (you do get a little swimming practice at times!) . This Whisky experience in Hobart is an informative, fun day with one of Australia's best distillers. Learn the process of crafting a fine single malt whisky, from mash to neat perfection. Travel to Richmond and have lunch at Meadowbank Winery; enjoy tastings and great things to see all day! Join us for one of Australia's most famous one day white water rafting experiences! Raft up to 45 rapids of adventure in magnificent World Heritage Rainforest with our experienced river guides. Throughout the day, you'll also enjoy a riverside BBQ for lunch. Design and create each other's unique wedding rings under the guidance of a top Sydney jeweller. Using yellow or white gold, you'll spend half a day perfecting your life-long symbols of commitment. Raise a glass of champagne to your creation: it's the perfect start to your married life together! The rapids of the scenic Goolang might not give heart palpitations to the serious adrenaline junkie, but offers plenty of thrills and exhilaration to participants. Grade 2 & 3 rapids (on the international scale of 1-6) provide constant action on this half day whitewater rafting experience. 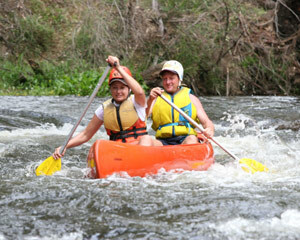 Half day white water canoe tours on the Clarence River. Tackle rapids, see wildlife and get back to nature with your friends on this half day session. Are you looking for an action packed way to get your team working together? Its hard to go past white water rafting for a team activity that truly focuses the group on the task at hand! White water rafting in Victoria is now a complete holiday! With meals and accommodation included, you can focus on the fun stuff! Thrash down the river, no matter what your skill-level. 30 years experience means these guys can offer everyone an overnight adventure that you don't want to miss! Experience the excitement of 21st century rafting at its best on an Olympic class, purpose built whitewater course. Plus an Adrenalin Raft T Shirt for you to keep! Go on a winter white water rafting adventure, just outside of Perth, and experience the Western Australian wilderness in a way that you will never forget. White water rafting provides a unique opportunity for you to meet nature on her own terms and work with others in a team to explore and succeed! Australia's most famous one day white water rafting experience! Up to 5 hours and 45 rapids of adventure, magnificent waterfalls, World Heritage Rainforest and the assurance of a fully trained river guide, the Tully River is the ultimate in rafting! Rapids to grade 4. Relaxing, Classic and Wild - we have rapids suitable for white water rafting at any level. During your full-day rafting adventure you will experience majestic Victorian and NSW rivers, stunning scenery and wildlife. Simply choose the style that suits you and prepare for the experience of a lifetime! Experience the ultimate encounter with the forces of water on this full day white water rafting adventure. White water rafting is Victoria's greatest adventure activity. It is a must-do event and is perfect for a team building adventure or fun day out with some friends. So don't miss out! Experience the excitement and adrenalin of white water rafting on this half day adventure to the Barron River Gorge in North Queensland. The rapids are graded 2-3 with two - 'Rooster Tail' and 'Cheese Churn' - in particular being challenging. What better way to brighten up your day than to enjoy the thrill and excitement of white water rafting on the Avon River, just 60 minutes from Perth. Challenging rapids, scenic jarrah forest and a whole lot of fun can be experienced on this half day white water rafting trip!